Travellers Oasis i Cairns, Australien : Boka nu! Hostelworld guests have recommended Traveller's Oasis 'if you want a relaxed hostel with great people and a couple of [social] nights out'. This small, home-like hostel features a swimming pool and an outdoor terrace with BBQ as well as staff who are 'superb, full of helpful advice and always there when you have a question', according to our visitors. They're located next to Cairns Central station, about 15 minutes' walk from the lagoon. 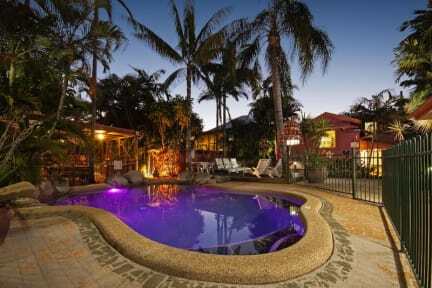 Welcome to Travellers Oasis Backpackers in Cairns. We offer comfortable and clean facilities to budget-conscious travelers in a relaxed and friendly environment. Our premises are newly renovated and restored and tastefully decorated to capture the ambiance of the tropical North Queensland environment. We're nestled in the relaxing surrounds of lush tropical gardens, with a pool and BBQ area with lots of Hammocks to relax under the palm trees, we want you to enjoy the comforts of our home at your fingertips. We offer all types of accommodation, with 3,4and 6 bed dorms, We also have single and twin rooms, plus double rooms with queen-sized beds all Private rooms have a Television. Our Deluxe Double Rooms have a queen-sized bed, LCD TV, DVD and Hard drive with 1500 films to watch and a balcony with a hammock. All private rooms include a refrigerator, bed-side lamp and a table, while all the rooms (including dorms) come with fresh linen and towels, a ceiling fan and coin-operated air conditioning. We're small, with only 50 guests maximum, and we're centrally located just a short walk to Cairns city centre, shops, cinemas, banks, supermarkets, restaurants and the waterfront...and close to the dive schools! We have good beds and all the comforts of home, plus we pride ourselves on our clean facilities. All linen and towels are supplied at no extra cost. The small size and location of our quiet oasis makes for peaceful surroundings where you can relax and have fun. Our garden and pool area is a great place to hang out and meet new people! We offer free tour booking and an information desk, a tropical pool in a relaxed garden atmosphere, two fully equipped kitchens with gas oven, a BBQ and prep area with all utensils, a TV room with LCD TV and DVD player, and Hard Drive with 1500 Movies plus laundry facilities (washer, dryer and iron). Guests can take advantage of our Free games, magazines and book exchange as well as our complimentary tea, coffee and herbs. We provide free luggage storage, ample off-street parking, internet access and WiFi. We have an awesome info desk right here in the hostel. We offer some great tours, activities and lots of free maps and itineraries. There are always special offers running with some great savings...Please feel free to email us after booking with any questions or price inquiries. One of the best hostels I've ever stayed at. Felt right at home and the staff are SO NICE and helpful. It's a bit pricy for Cairns but so worth it. Not a party hostel but people are always up for a chat and a few beers. Close to the mall and the city! Really clean!! I would recommend it for everyone. Amazing place, staff are incredibly helpful (big thanks to John!) & planned my whole cairns trip with a bunch of great tours. Atmosphere is a big plus as well. We had an amazing time at Traveller's Oasis. Best hostel we've ever stayed in. In addition to doing a great job running the hostel, the staff also double as (free!) travel agents. Big thanks to Mickey for all the help. A very nice place if you want a calmer, more relaxed hostel. Nice staff, good vibe and the style is just great! Really recommend it! I don't have anything bad to say about this place. I really enjoyed my 4nights stay here and didn't want to leave. Such a good atmosphere. And the staff is just amazing. Helpful, happy and welcoming. I'd say that what makes us special is that we pride ourselves on our attention to detail - it's not for nothing our manager won the Cairns Tourism Association's 2012 Award for Service Excellence! In fact, I think our customer service is second to none. Another unique feature is that we have extremely comfortable beds. There's no bunk beds, only single and loft beds. Plus, there's extra pillows in the double rooms and hammocks throughout the hostel gardens. We even have a swimming pool and sun deck! Cairns Central Shopping Centre is just across the road, while the Green Ant Cantina - a local favourite restaurant and bar - is around the corner. The Pro Dive school is only a three minute walk away - and of course you can't miss the Great Barrier Reef!